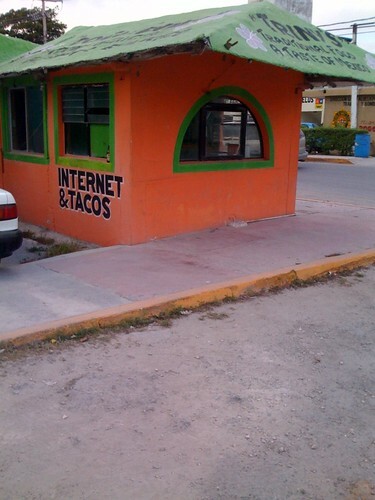 Internet and Tacos, originally uploaded by netwert. Lordy lordy, he did it again. Paul is amazing. Sometimes I wonder, as I pursue (gradually) healthier eating habits and begin shopping for food for my son, whether buying “natural” foods makes a difference. I’m fairly progressive, but I’ve never fallen hard for organic foods or shied away from processed sweets. The difference doesn’t always shout out at me. And then I read some labels. The difference is a revelation. So, too, is the nutrition that comes from each–the Skippy has four and a half times as much sodium, two and half times the carbohydrates and four times the sugar. In fairness, Skippy now makes a Natural line of its own, so this isn’t really about how Unilever is evil. It’s a reminder to myself that the processed foods of the past half-century do, indeed, come from worse places, no matter how good they taste. The current trend away from these foods is a bandwagon I’m going to try to stick with. I doubt I can do anything to help Nate’s sweet tooth, which I inherited from my grandmother. But at the very least, I can get him hooked on the right kind of peanut butter.